This beautiful church is dedicated to St Julitta who tradition has it - was one of the daughters of King Brechan. He and his children are said to have come across the sea from Wales around 500 AD bringing Christianity to this area. Many of the churches in North Cornwall are named after his children, such as Advent (St Adwenna) as well as St Teath, St Endellion, St Minver, St Mabyn and many other places. However, it seems much more likely that the church is named after St Julitta, an early Christian martyr. There are several churches in Cornwall and the rest of England named after her - often together with her infant son, St Ciricus. The name 'Lanteglos' derives from the Cornish 'Nant Eglos' meaning 'Church in the valley'. The name strongly suggests that this was an early Christian site possibly dating back to the time of the Christian Missionaries from Wales in 500 AD. The church is surrounded by what used to be 130 acres of glebe land belonging to the church which includes a rushing stream and a holy well - a perfect site for an early Christian monastery. St Julitta's is the mother church for the parish of Lanteglos by Camelford with Advent and is grade 1 listed. Historic England has allocated a priority Grade A for restoration as the buildingt is at immediate risk of further rapid deterioration or loss of fabric. The Friends of Lanteglos Church has been set up to 'save' the church and is in the process of raising funds. (See Friends of Lanteglos Church (FOLC)) in drop down menu above. The oldest part of the church is the north wall and the transept (on the left looking towards the altar) which dates from Norman times. Lanteglos was part of the ancient manor of Helstone going back to Saxon times or earlier. In 1086 the manor was held by the half-brother of King William I, Robert, Count of Mortain, said to be one of the wealthiest men in England. The manor had 2 royal deer parks of about 130 acres in total. This eventually became a part of the Earl of Cornwall's estate and around 1275 the Earldom acquired the right to appoint a Rector to the church at Lanteglos. A list of Rectors from 1275 to the present day hangs by the granite pillar close to the main door. It was probably around the time of Richard, Duke of Cornwall and Holy Roman Emperor (1209 - 1272) that the area next to the church became a Royal Deer Park - now a golf course! It was in 1259 that Richard granted Camelford a charter for the right to hold a market. In 1311 a small chapel was built by the river in Camelford dedicated to St Thomas of Canterbury. However, the mother church - St Julitta's - has remained at Lanteglos and for the last 800 years has been used for worship, prayer and community celebrations. In 1545 St Thomas's chapel in Camelford was confiscated and deconsecrated by Henry VIII as part of the Reformation. A new church also dedicated to St Thomas was built in 1937 near the centre of Camelford. The 70-foot-tall tower is 14th Century and is set off centre, angled toward the south in relation to the nave for no obvious reason, but it may have something to do with the orientation of the earlier Norman church. In 1549 there were 3 bells in the tower. These had to be recast in 1783 in a field at nearby Helstone when 3 more bells were added. The peal of 6 bells is regularly rung. Each bell bears the name of a local dignitary such as Charles Phillips MP who controlled the ‘Rotten Borough’ of Camelford elections for the government and his brother Rev William Phillips - Rector of Lanteglos from 1747 for 47 years. The Rev William Phillips has a memorial to him in the church and was held in great affection by local people. He had an interest in Turnpike toll roads and carved the figures on the milestones from Camelford to Five Lanes. One of his milestones remains and is set in a wall on Trefrew Road in Camelford. It has a cross carved on it and the date 1752. It is one of the oldest milestones in Cornwall and probably the only one where the carver is known. Some of the 19th century wood carving is really fantastically delicate and highly skilled. The carving on the pulpit in memory of Susanna Pearce 1887 is a good example and look at the brass lectern and the elaborate wooden screen separating the lady chapel front the chancel- both donated in memory of previous rectors. The Rev Robert James Baker Carr who died at Lanteglos in 1886 was the grandson of Rev Robert James Carr, Bishop of Worcester and close friend and advisor of George IV. The Holy Communion Challis is also Victorian, dated 1877 made by John Foster Co in London. An earlier silver guilt Challis and plate dated 1547 have somehow disappeared and have not been found in spite of extensive searches. Many of the churches in Cornwall had major renovations carried out in the 15th century and Lanteglos was no exception. This is when the South aisle and porch were constructed. Also around that time the beautiful Saxon font was replaced by a much larger font with an interesting decoration carved into the Pentewan stone. The Saxon font languished in the rectory gardens and was used as a plant pot until it was rescued and found its way to the small church at Washaway on the road between Bodmin and Wadebridge where it remains to this day. It is thought to be one of the oldest in England and ownership is still disputed! The south side aisle was added in the 15th century and the windows contain small remnants of the original glass set in the upper tracery. Each one represents a biblical figure and is thought o be by the same glazier who made some of the early painted glass in Exeter Cathedral and at St Winnow. Miraculously these ancient small pieces of glass placed here when the church was part of the Catholic tradition have somehow survived the destruction of the Reformation. King Solomon with St Mary and Salome with Joachim. St James the Great, St Andrew and St Peter. St Jude and St Bartholomew. There is also some ancient glass set in the top lozenges of the window on the north side of the chancel. The owner of the coat of arms with goat heads and 5 ermine spots was probably Thomas Moreton the 20th Rector of Lanteglos in 1489. The central lozenge shows the head of St Christopher and on the left is a bunch of grapes. The arcade of thin granite pillars were carved from local granite. They have the remains of rusty holes where acetylene lamps were once fixed. The 15th century wagon roof above the nave has over the years spread slightly and put pressure on the granite pillars so that they lean slightly towards the south wall which in turn has put a strain on this outer wall. The effect of this can be seen from outside where some of the granite blocks have been dislodged. At the back of the south aisle there is a stone memorial to members of the Wallis Family from Fenteroon, Camelford. It commemorates the 5x Great Grandfather (Died 1565) of one of the first circumnavigators of the world - Captain Samuel Wallis. 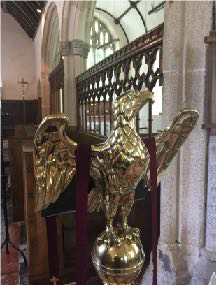 Samuel was born in Camelford in 1728 and was baptised in the same font that you see in the church today. At the age of 38 he was given command of the large 24-gun frigate HMS Dolphin with instructions to circumnavigate the globe and search for new territory. In 1767 he discovered Tahiti and many other small islands. One in particular is known as Wallis Island, now in French Polynesia and where they still speak ‘Wallisian’. This 2-year trip into the unknown was renowned for the lack of scurvy and illness thanks to the care and foresight of Captain Wallis. Although the carving on the present 15th century font has been reported as a Flemish design, an internet search suggests that it is much more closely related to one of the earliest of pre-Christian symbols - a symbol of the sun or the universe. This ancient symbol on the font is repeated in the tracery of the east window and in the reredos behind the altar. Similar 'swirling' symbols can be seen elsewhere in the church - at least 14 altogether. This is very unusual, although the same symbol does occur in the 15th century window tracery in the south aisle in the nearby church at Advent which helps to date the east window at Lanteglos. The north wall of the chancel had a priest's door for direct access to the sanctuary of the chancel. It was blocked up in 1853 but the remains of it can be seen on the outside of the church. In the south wall of the chancel are 2 sedilia placed rather too high to sit on. This dates from the 15th century and the original wagon roof with carved timbers is still in place. Also of the same date is the recess on the right of the main door where there was once a Holy Water stoup during pre-reformation Catholic times. Note the elaborate metal work on the door hinges, the massive handle and outside the porch, the boot scraper and sundial dated 1719. The wooden board inside the porch entrance is sadly illegible but reports that the church received money from the Incorporated Society for Buildings and Churches in 1864 when a major restoration took place. The Victorian architect JP St Aubyn was responsible for the restoration and also restored many of the churches in the local area. He was the overseeing architect for the restoration of St Julitta’s between 1864 and 1873. He was the Cousin of Lord St Levan of St Michael’s Mount and was responsible for the restoration of the buildings on the Mount. Although he had a reputation for favouring heavy Gothic restorations this is not the case at St Julitta’s where the simplicity of the medieval building has been retained. It seems likely that his involvement at Lanteglos was limited as St Julitta’s Church is not on the main list of his restorations. However, his trade mark was to place a boot scraper outside the porch as there is here at St Julitta’s. There is a board on the wall in the tower that outlines a bequest dated 1804 by Charles Phillipps, the brother of the Rector William Phillipps mentioned elsewhere in this booklet. Charles was a Lieutenant Colonel in the Cornwall militia and a Recorder for Camelford. He was also an MP for Camelford and the Parliamentary manager for Lord Thomas Pitt – the 2nd Baron of Camelford. His bequest for £170 was specifically for the poor of Camelford to be administered by Charles Carpenter, also a Recorder for Camelford. The large old lock on the porch door has a massive key (pound coin inserted to give an idea of size). Perhaps this dates from the15th Century like the porch itself. The rusty holes in the granite pillars is where Acetylene lamps were installed around 1880 using a newly patented gas control system from Germany made by H Mueller Co. Acetylene gas was released when water is dripped onto calcium carbide. This type of lighting was thought to be especially useful in isolated places Although at one stage the street lighting in Camelford itself was posed by acetylene gas. Outside the west door are 2 weather-worn 14th century heads of a man and a woman on either side of the door. The passage through the west door into the tower reveals that the tower wall at that point is unusually thick. The churchyard has a fast flowing stream running through and gravestones dating back to the 17th century. There are also Grade ll listed tomb chests and 3 war graves. Outside the south porch are 4 wayside crosses that have been moved to the churchyard for safe keeping. Together with the 11th century Castle Goff stone shaft they form a scheduled monument of national significance. The Saxon shaft has an inscription which is impossible to read today. It tells that Alseth and Generth carved the stone for Elwyn’s soul and for themselves. Castle Goff is a nearby iron age circular fort 80 metres diameter on the other side of the valley with a typical bank and ditch construction indicating the importance of the ancient Lanteglos site. In the 19th century there was a Charity School for Boys at Lanteglos. It was positioned by the metal gates on the north side of the church and local boys attended for a penny a week. The building was finally demolished in the 1950s but there is a painting that confirms its original position. A quarter of a mile up the road towards Camelford is Juliot’s Well a holiday complex named after the ancient holy well that lies within the grounds. Another indication that the area around Lanteglos is indeed a very ancient religious site.